Viking River Cruises has nine itineraries that offer travel on the Rhine River. Packages are from 8 days to 23 days in length and may include travel on the Moselle, Main and Danube rivers. You’ll find itineraries between Paris and Prague, Amsterdam and Bucharest, Basel and Bergen, Basel and Barcelona, and Amsterdam and Antwerp. Let’s take a look at two of the Rhine River cruises available from Viking River Cruises. This is an 8-day itinerary between Amsterdam and Basel. For this post, we’ll look at the trip that begins in Amsterdam. 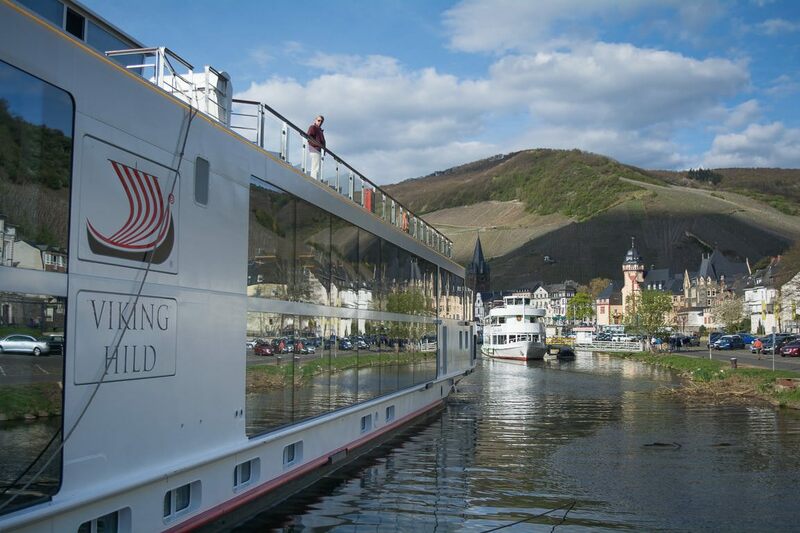 Viking River Cruises has the largest fleet in the river cruise industry with several of its Viking Longships that travel along the Rhine River. The ships are 443 feet long and carry up to 190 passengers. And the staterooms are between 135 square feet and 445 square feet in size. For the Rhine Getaway cruise, you’ll board your ship in the afternoon on the first day of your trip. Dinner will be served on board. There are no planned excursions; however, you’ll be free to explore the city independently after dinner. On day 2, you’ll cruise to Kinderdijk – a city that is famous for its windmills and has a designated UNESCO World Heritage Site known as the Mill Network at Kinderdijk-Elshout. Lunch will be served on board. In the afternoon, you’ll have the opportunity to sample some jenever, a distilled juniper liquor and to try some local Dutch cheeses, including Gouda and Edam. Rhine Getaway Cruise from Amsterdam to Basel. Image courtesy of Viking River Cruises. The third day of your cruise will be spent in Cologne. It’s about 150 miles southeast of Kinderdijk. You’ll take a guided tour of the city in the morning; and in the afternoon, you’ll have time to explore Cologne independently. You’ll begin your day in Koblenz on day 4. This German city is located at the confluence of the Rhine and Moselle rivers. You’ll take a guided tour of Koblenz, which includes a visit to the 12th-century Marksburg Castle. There is also an optional tour to Ehrenbreitstein Fortress available. Lunch will be served on board as you begin a scenic cruise through the Rhine Gorge, a UNESCO World Heritage Site, which is also referred to as the Upper Middle Rhine Valley. Your ship will arrive in Rüdesheim in the afternoon. There are no scheduled tours; however, you’ll have time to explore the city on your own. On day 5, you’ll travel by motorcoach from Speyer to Heidelberg for a guided tour of the city. Afterward, you’ll return to Speyer for a short visit before boarding the ship. The sixth day is spent visiting Strasbourg. Your ship will be docked in Kehl, Germany for the day. You’ll travel a few miles west across the Rhine River to Strasbourg. You can choose to take a guided tour of the city, an excursion through the Alsatian wine region or a enjoy a culinary tour of Strasbourg. You’ll arrive in Breisach, Germany in the morning on day 7. The featured excursion is a visit to a local workshop that specializes in making cuckoo clocks. You’ll see a clock-making demonstration, and you’ll also learn how Black Forest Cake is made. Lunch will be served on board the ship. In the afternoon, there are two featured excursions in Colmar. This French city is located about 15 miles northwest of Breisach. You’ll have the option of taking a guided tour of the city or another tour that explores Colmar’s World War II history. And finally, you’ll have the option to explore Colmar on your own. Your trip will conclude on day 8 in Basel. After breakfast, you’ll disembark and transfer to the airport for your return flight home. Cruise for this itinerary are available from March through December. 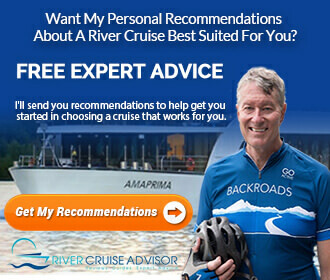 Prices begin at $2,499 per person to $2,999 per person for 2018 cruises and at $1,999 to $3,399 for the 2019 river cruise season. This is a 12-day cruise between Paris and Zurich that combines a 2-night stay in Paris and a 2-night stay in Zurich with a river cruise on the Moselle and Rhine rivers. The cruise on the Rhine River includes travel from Koblenz eastward to Basel and does not include destinations to the west, such as Amsterdam and Cologne. We will be looking at the itinerary that begins in Paris. There are no specific ships for this itinerary, since Viking has several longships that operate along this route. Passenger capacity, stateroom sizes and layout are similar for all of these ships. They carry up to 190 passengers and have staterooms that range in size from 135 square feet to 445 square feet. Your trip will begin in Paris where you’ll spend two nights in a hotel. You can explore the city on your own or join Viking’s Welcome Walk on the first day. Day 2 features a morning drive along the Seine River and through Paris where you’ll see some famous landmarks, such the Notre Dame Cathedral, the Louvre, the Musée d’Orsay and the Champs-Élysées past the Arc de Triomphe. You’ll be free to continue exploring the city during the afternoon and evening hours. On the third day, you’ll depart Paris by motorcoach to begin your river cruise in Trier, Germany. However, you’ll stop in Luxembourg City for a guided tour first. Luxembourg City is about 232 miles northeast of Paris. After departing Luxembourg, you’ll travel an additional 30 miles northeast to Trier where you’ll board your ship. Day 4 begins with a morning tour of Trier where you’ll see a few famous sites, including the Trier Cathedral, the Church of Our Lady and Porta Nigra. You’ll return to your ship for lunch and begin a scenic cruise along the Moselle River to the German city of Bernkastel. Your ship will arrive in Bernkastel in the early evening. After dinner, you’ll be free to explore the city independently or to join a wine-tasting excursion. On day 5, your ship will dock in Cochem during the morning hours. You’ll take a walking tour of the city, which features a visit to Reichsburg Castle followed by a winery tour with the opportunity to sample some local wines. You’ll enjoy a scenic cruise on the Moselle River in the afternoon as your ship heads toward Koblenz. The sixth day of your trip will begin with a morning visit to Koblenz. Later in the day, you’ll depart Koblenz and begin your cruise on the Rhine River through the Rhine Gorge. A few landmarks along the way include the Rhinefels Castle in Sankt Goar and Lorelei Rock. On day 7, you’ll spend the day in Mainz, Germany, which is located at the confluence of the Main and Rhine rivers. It is also the birthplace of the inventor Johannes Gutenberg. Your excursion will include a visit to St. Stephen’s Cathedral and to Gutenberg Museum. You’ll tour Speyer, Germany on day 8. The Speyer Cathedral is a UNESCO World Heritage Site. Other prominent sites in the city include the Altpörtel and the Old Town Gate. Day 9 features a visit to Strasbourg. You’ll be able to choose between a tour of Old Town or Petite France, which is surrounded by the Ill River. The other option is an excursion to the Alsatian wine region. On the tenth day of your trip, you’ll disembark in Basel. Before departing by motorcoach to Zürich, you’ll enjoy a brief tour of Basel. After arriving in Zürich, you’ll check into your hotel for a two-night stay. Day 11 will begin with a walking tour of Zürich followed by a cruise on Lake Zürich. Your trip will conclude on day 12 in Zürich. You’ll check out of your hotel after breakfast and transfer to the airport for your return flight home. Itineraries are available from April through December. 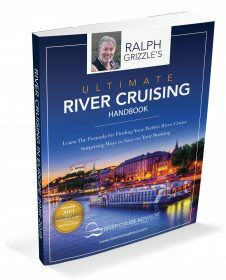 Prices start at $3,599 per person to $4,999 per person for the 2018 and 2019 river cruise season. So which itinerary is the best option? If you have less time to travel, then the Rhine Getaway if a better choice. 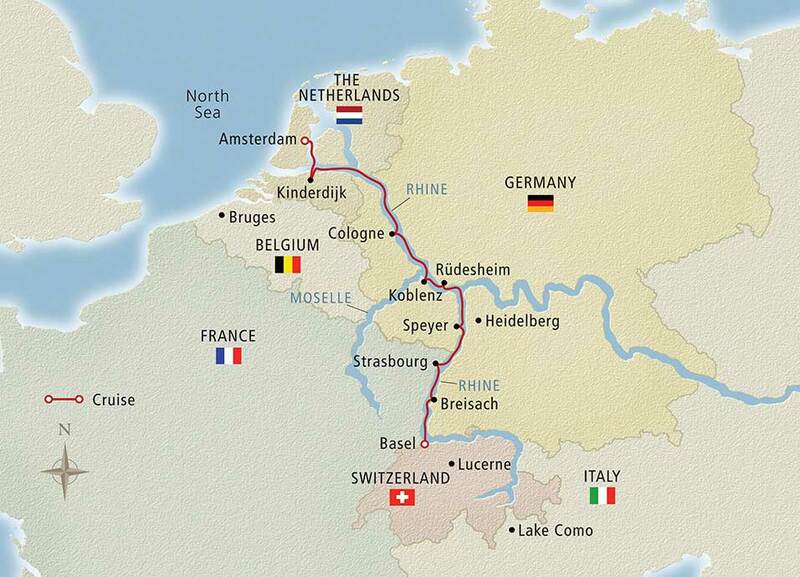 And if you want to travel the entire length of the Rhine between Amsterdam and Basel, it’s also the best option. On the other hand, if you have some extra time to travel and would like to travel on the Moselle and Rhine rivers, then the second itinerary is a great choice. It also provides you with an opportunity to visit Paris and Zürich where you’ll spend a couple of nights on land in a hotel. Although, you won’t experience the Rhine west of Koblenz, you will visit some destinations that are not included in the other itinerary. The following posts from Ralph’s May 2017 Rhine Getaway trip also are worth checking out.